BAF 2006: A great experience! Histroic Moment:Aardman Executive Chairman David Sproxton presents the BAF Special Contribution to Indian animation trophy to Hanuman Director V G Samant. Wow! What an Awards show! As much as winning is a great feeling, watching winners go and bag awards is a great experience too. And that’s what the FICCI BAF Awards 2006 show was. 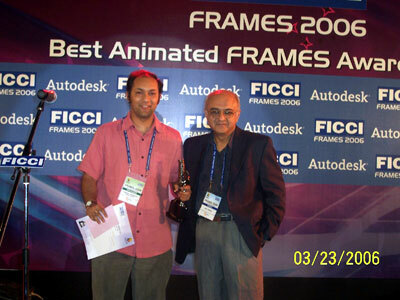 A great experience where some of the very best from the Indian animation Industry won! -A Five Hundred plus strong crowd including big wigs from mainstream media and entertainment as well as International dignitaries, giving a standing ovation to Indian animation veterans not once but on two occasions. That message holds a lot of depth in a country where art is not considered as a serious career option and where many a great artist curbs his instincts and takes a different path. The veteran director was presented his Award by none other than Aardman Executive Chairman David Sproxton. Aardman is renowned as the best clay animation studio in the world and boasts of a great library of Oscar Award winning films. It really was a great symbolic moment, the world’s best presenting the Award to India’s leading Animation personality. Another great set of moments was when the pride of Indian animation, Vaibhav Kumaresh dressed in a pink shirt walked the winning ramp thrice. Yes, Vaibhav won three Awards in the categories of NGO Social Message, Best Promo and Best Professional Short film. As Vaibhav walked to and fro collecting his Awards, the Indian idiom “Great things get discovered themselves” just rang though one’s head. One of the most talented Indian animation directors, Kumaresh heads Vaibhav Studios which does original animation for leading TV channels like Channel V, Mtv, Disney, Cartoon Network and Hungama. Forget marketing, Vaibhav does not even carry his card. Yet he won three Awards becuase his work speaks for himself. That’s a moment that should inspire Indian animation artists and students to let their heart rule their art! A positive trend noticed amongst the acceptance speeches this year was the fact that most of the winners including the studio heads made it a point to highlight the fact that Animation was a team sport and did mention the important role the entire team played in creation of the Award winnning entry. Prime Focus MD Namit Malhotra who won two Awards in the VFX Feature and Best VFX shot categories said that ,”I give all the credit to my team which has worked doubly hard to give their best to this film Namit was accompanied on both occasions by Prime Focus Visual FX producer Merzin Tavaria. Emphasising on Animation being a team sport, Ashish Kulkarni came accompanied with his two lead members Vikram Vetturi and Bala to collect the Award for best TVC Venita Kuchini. Simi Nallaseth winning for the best music video ‘In the air’ made special mention of her Art Director Jaswinder Singh who she said had,”Made some amazing backgrounds and with his aesthetics and visual prowess brought the whole video to life”. Students from MAAC Chandigarh rushing on to stage excitedly as they won for the best students’ short and ToonzWebel’s Rudra going on stage to collect the Award for his academy’s students brought in the students flavor to the Awards ceremony. There were many winners at the Awards but what was most important was that events like these foster motivation and help cultivate a positive bon homie within the industry and ultimately the victory is for Indian animation. 18 Special Contribution to Indian Animation Industry V G Samant, Director of â€? Hanuman â€? Uncle Pai , Creator of â€?Amar Chitra kathaâ€? & Editor of â€? Twinkle â€? And here’s what some of the winners told Animation ‘xpress on how they felt! Anirights’ Ashish Kulkarni: The Italian client wanted clay animation and I couldn’t get Viabhav or Dhimant under the tight deadlines. My team led by Bala and Vikram told me that they’d give the client that look in 3D and we succeeded.